After the neck blank is sawn from the raw block, and while it is still square, I cut the truss rod groove. I do this on a spindle shaper. 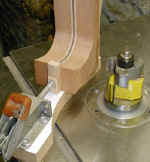 The jig has the curvature of the slot cut on its front edge, and the the neck is firmly clamped in place. 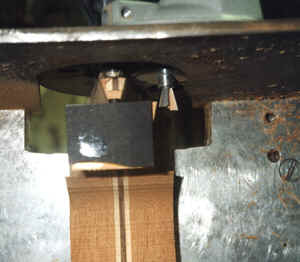 The cutter (which I had made many years ago) is simply a round bottom 1/4" cutter. There is a ball bearing that follows the edge of the jig and makes the cutter cut a slot with the proper curvature. 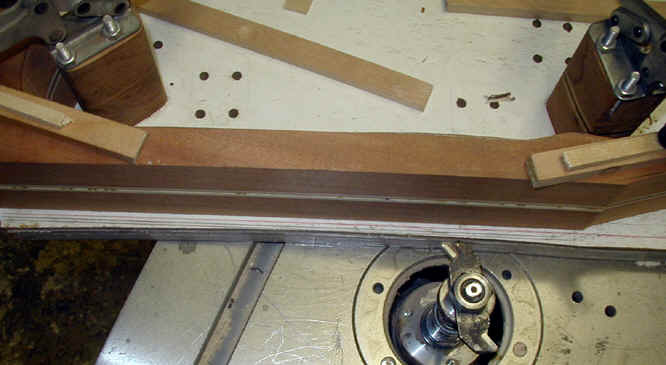 My truss rod is a traditional Gibson style - anchored at the dovetail and adjusted at the peghead. I find that if the slot is curved (i.e. 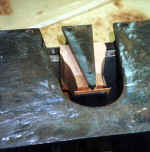 slightly deeper in the middle than at either end) it works better. 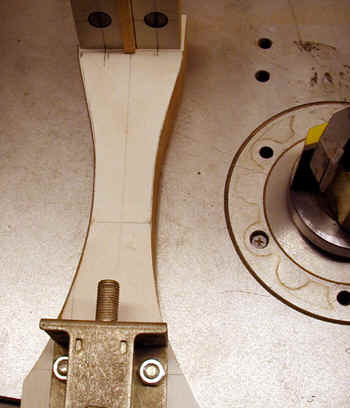 And another - perhaps the curve in the jig is more visible here. 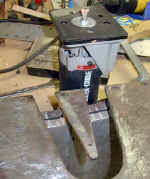 Here I am rough shaping the heel on the spindle shaper. The jig is shaped like the heel, the cutter is straight and the ball bearing rub collar rides on the edge of the jig, thereby cutting the heel. 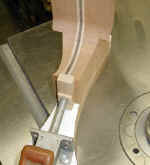 Another view of the heel shaping jig. 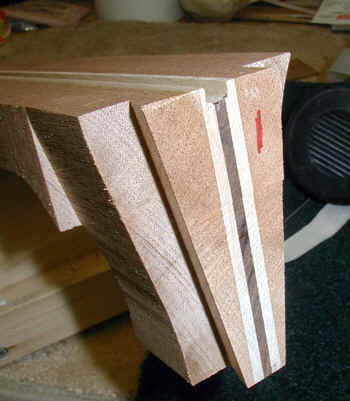 Note the piece of maple in the upright surface, which engages the truss rod slot and aligns the neck in the jig. 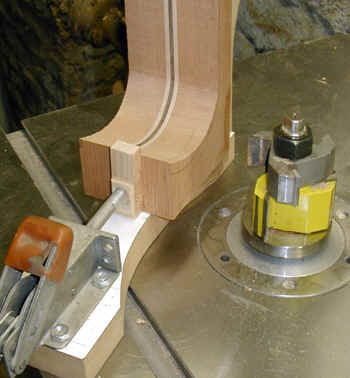 This is the jig which cuts the dovetail in the neck. The photos should be fairly self-explanatory. 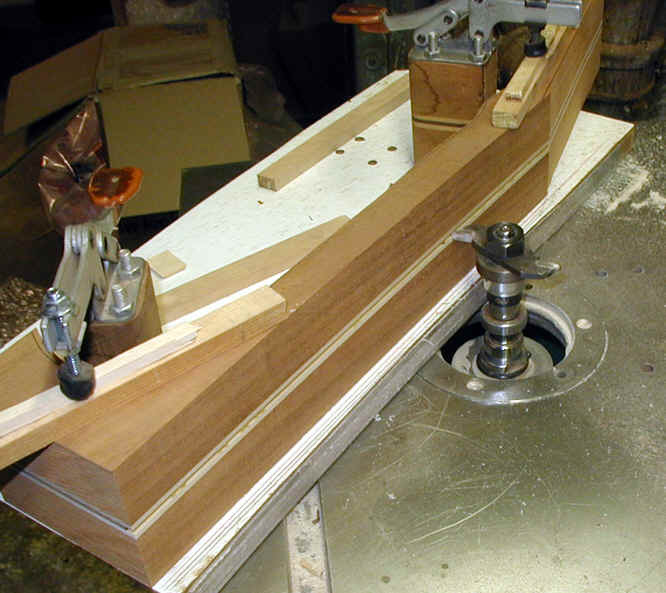 The only thing not visible is that there is a 1/4" wide piece on the face of the jig which engages the truss rod slot and thereby ensures that the neck is held in perfect alignment. 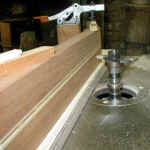 Here is the "working" part of the jig. 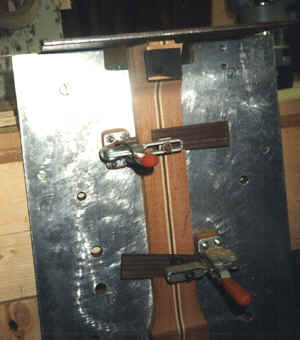 Another view, with the router that cuts the joint. 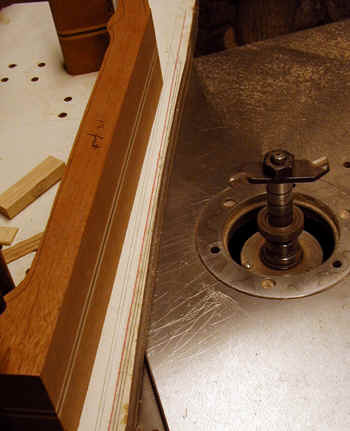 Here is the router and its cutter. The photo is a bit dark but the router has a guide which follows the shape of the jig. A dovetail on a short heel - in this case for a parlor guitar.